Glockenspiels and xylophones are both melodic percussion instruments. Originating in different parts of the world, the instruments have similar design, but use different materials, resulting in very different sounds. Dutch bells influenced the glockenspiel, an instrument of German descent. Glockenspiel is translated literally as "bell play." The instrument originated in the Middle Ages. 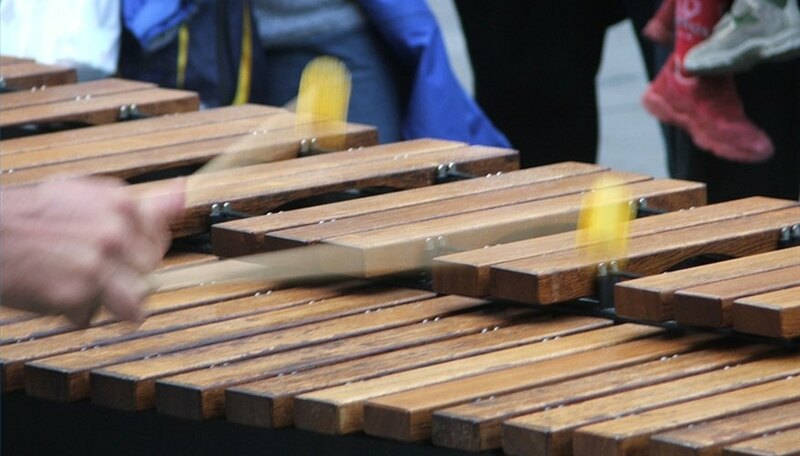 The origins of the xylophone are uncertain, but probably came Africa, India or Indonesia. The instrument first appeared in Europe in the early 16th century. Xylo comes from the Greek word xylon, "wood." A glockenspiel, a metallophone, is composed of 2 1/2 octaves of steel bars. The glockenspiel has higher frequencies, and generally ranges from G5 to C8. The glockenspiel sits horizontal and its bars are set up as a piano keyboard, with the black keys, or the sharps and flats, raised above the naturals. The bars are hit with hard mallets for bright sounds, or with soft rubber mallets during softer passages. A smaller version of the glockenspiel, known as a bell lyre, is played vertical in marching bands. Xylophones are the oldest melodic instruments. Most commonly composed of 3 1/2 octaves of wooden or synthetic bars, set up in the style of a piano keyboard, the sharps and flats raised. Xylophones can be larger, sometimes necessitating two to three players. Resonators, metal tubes containing air, are placed under the wooden bars. The resonators pick up the vibrations of the bars, and amplify and sustain the notes. Xylophones and Glockenspiels are both percussion instruments. They are both played with mallets, and often double the prominent melody of another instrument to layer sounds. The keyboards of both instruments are designed the same. Glockenspiels are made of metal, and xylophones of wood. Xylophones generally contain an extra full octave of notes than a glockenspiel, and sometimes more. Xylophones are equipped with resonators, and glockenspiel amplification is strictly from the metal bars.